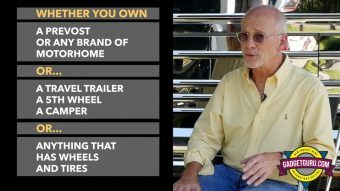 In continuation of my Prevost For Newbies series, in this episode I continue my conversation with Robert Hitt, the Service Training Manager for Prevost. The topic of the day is: When to lift the tag axle. While you can scroll down to view the video, it’s my norm to use this page to provide the background of what led me to this story. Before we get to the “lifting the tag” video interview, allow me to turn the clock back to February 2017 when I was nearing the end of my shopping process, or more accurately, my due diligence period. It was at that point I spent a day with Caleb and Johnny at Florida Coach in Kissimmee, FL. 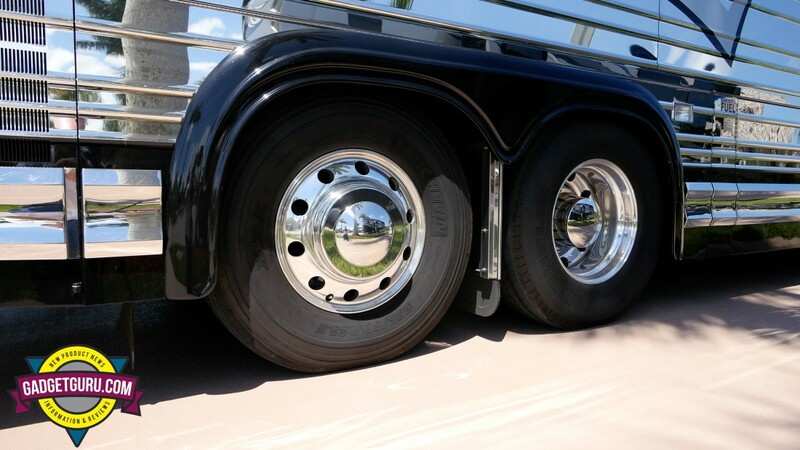 While this company flies under the radar and is relatively unknown to the recreational motorhome shopper, you can occasionally find Florida Coach Prevost conversions for sale on sites such as Prevost-Stuff.com. It was through that site I first became a aware of their offerings. 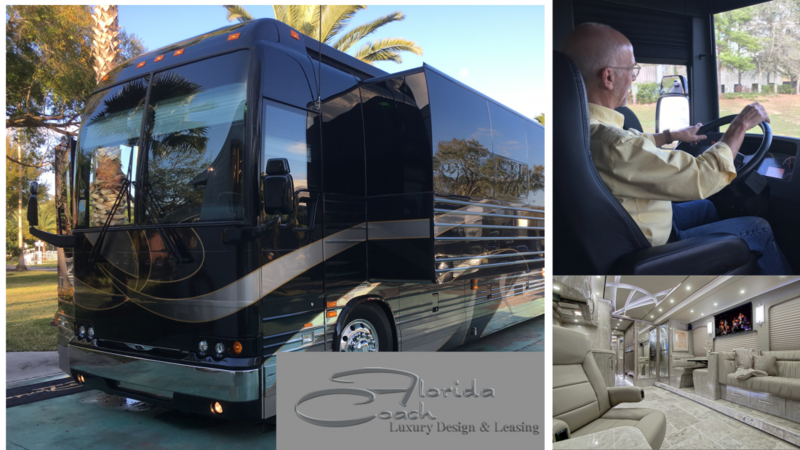 Florida Coach is a well known player within the entertainment industry as they specialize in creating custom Prevost star and entertainer coaches for the music, entertainment and commercial industries. Unlike the typical Prevost motorhome converter, Florida Coach not only sells its creations, they manage a fleet of busses that are provided on a lease basis for various businesses and have a full service facility and a network of reputable service providers that can quickly provide repairs when these coaches are on the road. When needed, they have the ability to provide professional drivers for their leased customers. From what I learned from my visit, these busses are maintained well and typically offered for sale after a few lease cycles. However, until recently, modifications were required to allow their busses to be used for a recreational user. 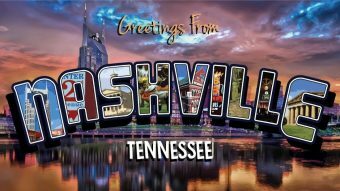 The reason I felt the need to provide this background is that like most first time buyers, during my shopping process I received the bulk of my information from a variety of online forums. 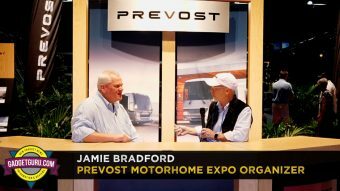 While for the most part this information is helpful, I found it a wonderful opportunity to use this visit to ask questions to gain the point of view of those using Prevost coaches commercially. As Caleb, Johnny and others I’ve visited will surely tell you, that I’m not shy about asking questions! With all that said, wanting to know more about this converter, I contacted them to see if I could come by and learn what they do and to see if their coaches looked as good in person as they did online. Because they cater to those seeking a luxury coach for commercial usage, my request was a bit unusual, but they took the time to peruse this site and gave me a full day of their time. By the way, their coaches are as nice in person as they are online. I’ll say that I was impressed with what I learned that day. The facilities are more like a recreational campus with a relaxed atmosphere than a bustling factory. Considering the number of coaches they convert each year, this was a welcomed surprise. The people I met seemed to take pride and enjoy what they do. After a nearly full day of conversation, I was offered the opportunity to take a test drive of a two-year old model with 90,000+ miles on the odometer that had recently come off-lease and was being offered for sale. 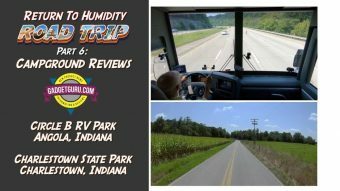 My expectations were fairly low for a coach with this many miles and after driving numerous new and pre-owned RV’s and motorcoaches, I wasn’t sure what to expect. I’ll cut to the chase and tell you it was as smooth, quiet and confident as many of the much lower mileage coaches I had experienced during my shopping process. To me that spoke volumes about the way they maintain their fleet of coaches and proves the point that Prevost’s are built to last. With Johnny riding shotgun I fired off the “when to lift” question as we approached a stop sign preparing for a right-hand turn. After all, at this point I had received the bulk of my information from online forums and I now had the opportunity to ask someone who has numerous coaches on the road at any given moment which are piloted by a staff of professional drivers. Before I get to his response, allow me to provide the most basic of explanations of the purpose of a lifting tag axle. 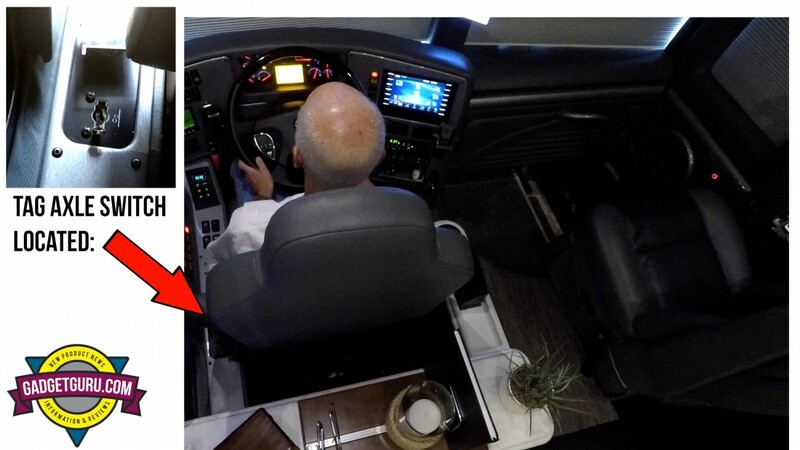 For those who may not be familiar, the “tag” is the aft set of wheels (on the left in the picture above) and are in place to support the weight of the rear of the coach. 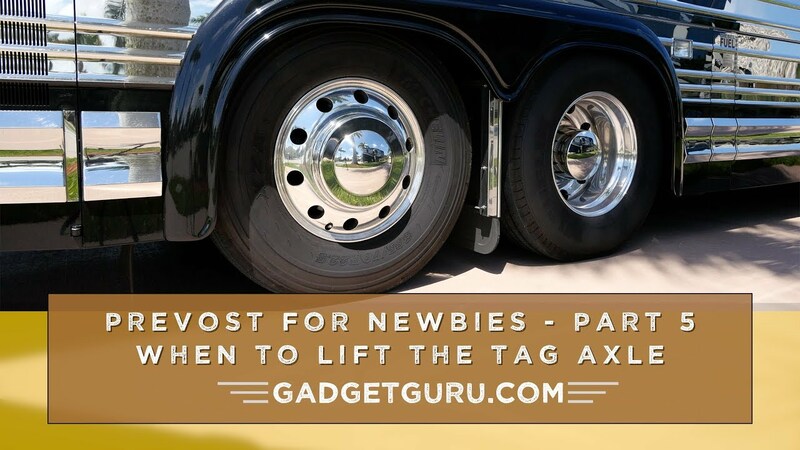 While the set of wheels just forward of the “tags” are the ones that drive the coach and have a pair of tires placed side-by-side, the tags feature a single tire on each side and incorporate a mechanism that allows the rear tires to slightly lift from the ground, Simply stated the tags are there for weight support. “Lifting the tag” is accomplished by sliding a cockpit mounted lever forward and that action uses a combination of compressed air and a chain mechanism to pull the rear axle upwards and results in less weight on the rearmost tires. Since Florida Coach has a fleet of Prevost coaches on the road, I thought that the moment I approached the stop sign would be an opportune moment to ask this question. The response I received was they instruct their drivers to lift the tag every time the coach is making a 90-degree turn. Yes, there are exceptions, but for the most part, it’s a procedure they advise to their drivers. Their reasoning is that it not only allows the coach to turn sharper, it lessens the wear and tear on the tag tires and related components. If the tires are left down during a sharp turn, they can drag and scuff the pavement during a sharp turn and possibly shorten usable life. While the tire wear and tear aspect means a lot more to for a commercially operated bus as it logs higher mileage than a typical motorhome and surely goes through tires quicker than an average user, from what I’ve learned to date, it seems that it’s a good habit to take Johnny’s advice and when it’s appropriate, reach for the lever and lift the tag when taking a 90-degree turn or when undergoing parking lot maneuvers. 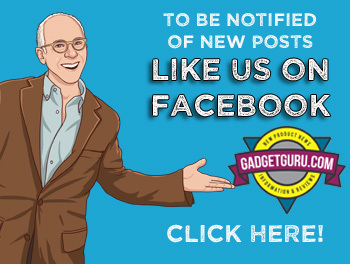 Questions, Comments and Opinions are welcomed here on my Facebook page or on your favorite motorhome forum.